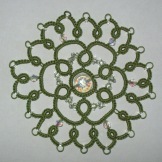 The Fringe Element Tatters upcoming Tatting Weekend will be September 28 & 29 in Cambridge Ontario. This year theme is "Knotty Tatters". The Registration Form along with photos of some class projects are posted on the Tat Days website.